I have been busy recipe testing. The team I work with at Melrose and Morgan are publishing their first book in October which is the most wonderful compendium of food. Good Food For Your Table is a guide to food, written in an easy colloquial readable style, designed with quirky snippets and fun facts, plus some simple suggestions for piecing together a dish and a handful of recipes as well. All in all, it is going to be the most fab Christmas pressie when it comes out so you all know what you are getting this year! But for now, we are busy ensuring that the recipes translate from a professional kitchen and chef’s knowledge to the layman, hence my involvement. When you read a recipe, you really don’t get just what has gone into writing it. Every gram is critical. Every comma. Every description. If you say cut lengthways will you cut it right? do we understand a finger of lemon peel? how to bring together a loaf of bread dough? how much is in a pinch? I could go on. So under the watchful eye of Mr Melrose, I worked my way through the recipes, checking, perfecting, weighing and tasting my way through a small proportion of the repertoire. It is just one step in a long commitment to creating their book and putting themselves out there to be reviewed. I guess the well known chefs have a team of stylists, writers, home economists and so on to support with the process but for us, it is a matter of getting stuck in and working pretty damn hard. My kitchen gets a good work out…. One of the many lovely things about this process is sharing the experience with like minded food fanatics like me. Last week I cooked one evening with my nephew Asher and this week I spent quality time with Mr M. It was also a great excuse to give my relatively new kitchen a run for its money. And it stood up well. When you design a kitchen it is difficult to imagine whether or not it will facilitate an easy way of using it and I am pleased to report that most of my decisions were right. 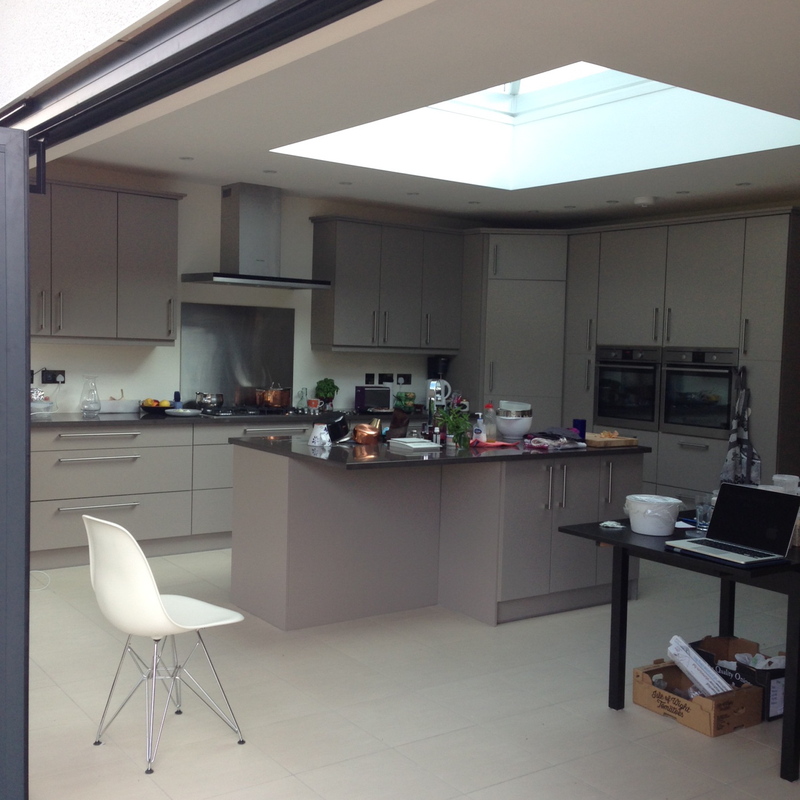 The best bit, given the heatwave we are currently experiencing, was having the bifold windows fully open bringing the kitchen into the garden to benefit from the small breezes from outside. Our recipe test journey started in the professional kitchen weighing and measuring out the many varied ingredients that we needed. It’s quite a job in its own right but great when you have the quality of ingredients that these guys use on a day to day basis. We butchered the most wonderful Sutton Hoo chickens, benefitted from the best pastry the kitchen makes, a full and varied seeds & spice rack plus beautiful produce. It’s no wonder the Melrose and Morgan shop has a loyal following. Then we loaded up the boot, added in the cameras, computers, books etc. and drove back to me. Tuesday morning we had a slice of my freshly baked rye loaf (yes – the Bread Ahead starter is doing a fab job at helping me create superb bread) with some of that Tayberry jam we made the other week and we were ready. Mr M was sous chef to me for the days which I took full advantage of. He weighed, chopped, zested and prepped so all I had to do was combine and cook. You have to wait for the book to see the recipes, but what I will say is that I am absolutely sure that they are going to double my usual repertoire, if not triple. 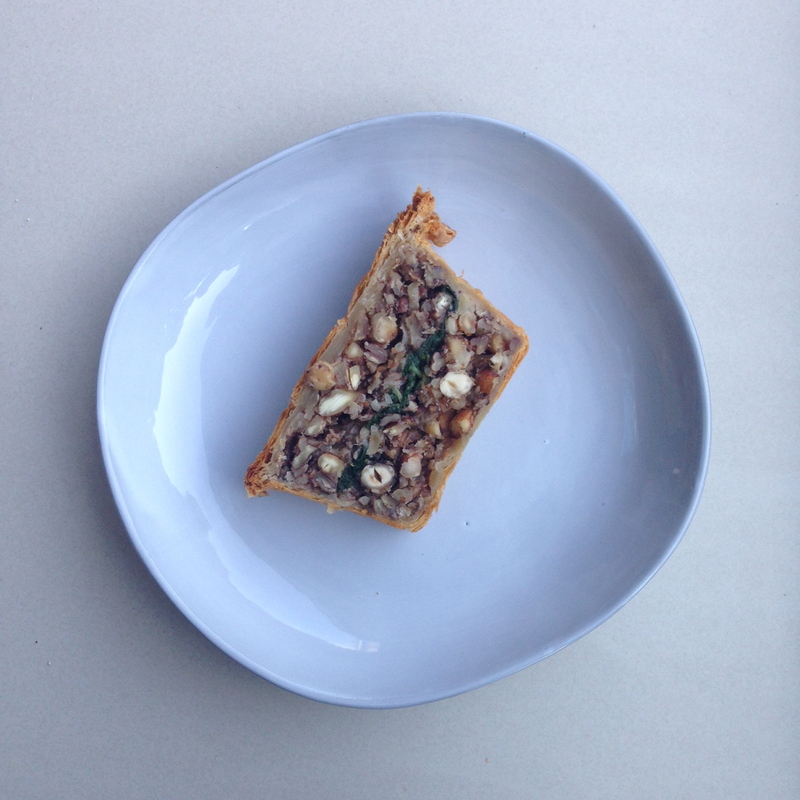 It is so lovely to find recipes that work and result in tasty yummy food. 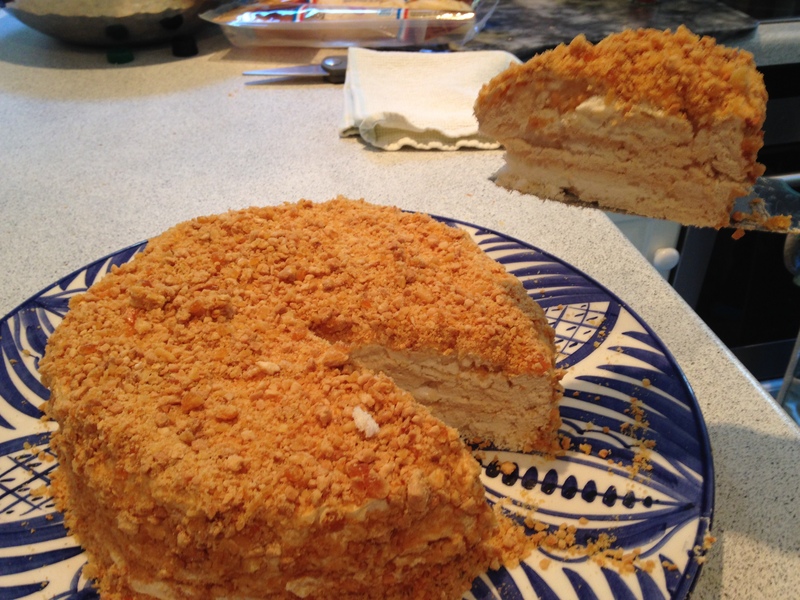 Over the days we were cooking, I encouraged friends to pop in and try. 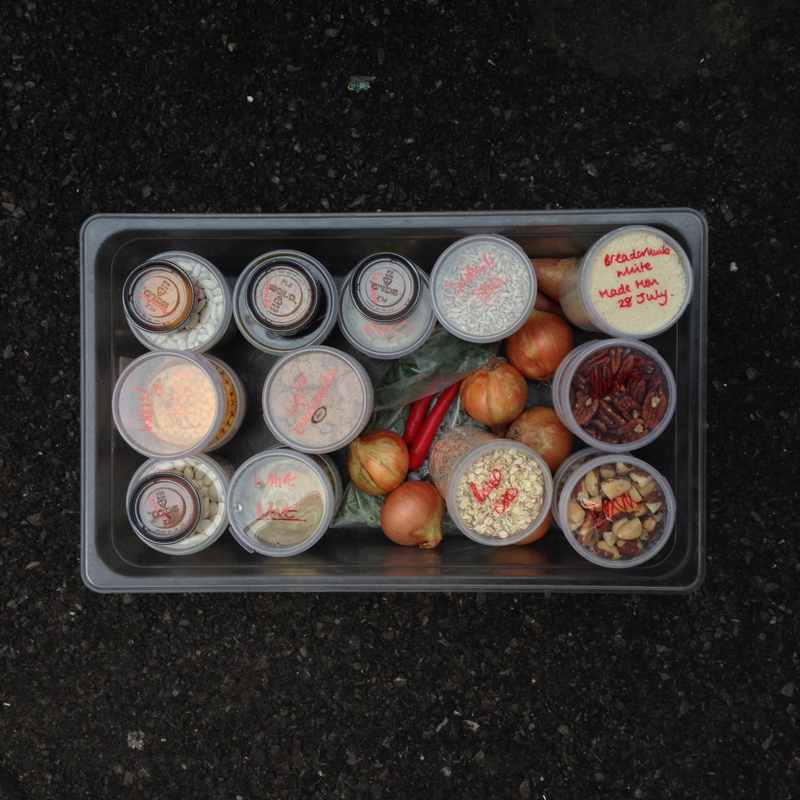 Everyone was suitably impressed taking home pots and tubs, foil wrapped gifts and jars of our creations. Some are still sitting in my fridge this weekend for me to enjoy and other random bits of chicken, stock etc. are in my freezer. So thank you Mr and Mr M for trusting me with your recipes. I had so much fun and look forward to loads more if at all possible. 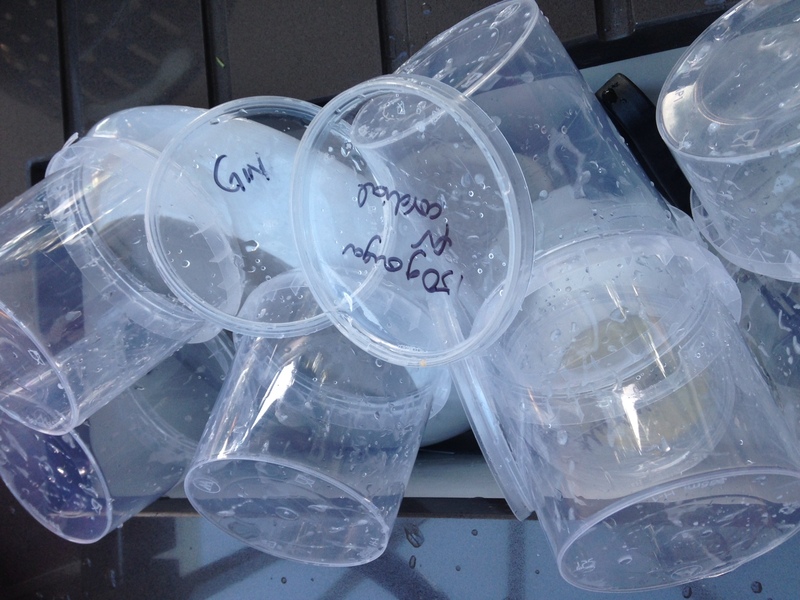 The only downside was all the washing up – next time we need a potwash in the team! When I travel I like to plot my list of food shops to visit on a map so that I can focus my energies in the right areas. You generally find that there are some key streets or areas that become the focus for great food places and once you wander around you find others to inspire as well. In London, my favourite is Marylebone High Street, closely followed by Columbia Road on a Sunday. It’s Abbot Kinney in LA, La Boqueria in Barcelona and a tour of the vineyards off the beaten track in Cape Town. You get the idea. This weekend, we were at lunching at friends who live in Clapham and it’s not generally an area I know well. 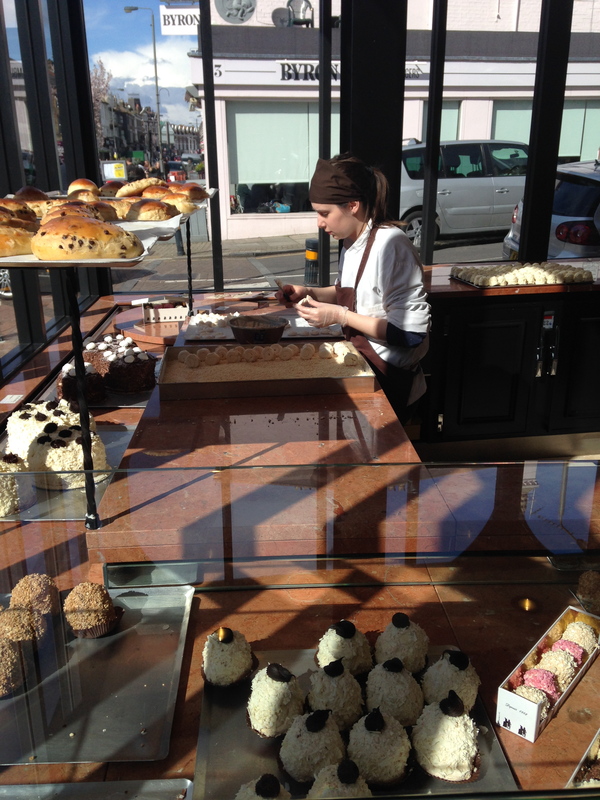 But I have read about many places that seem to centre around Northcote Road and my cake-making crony was waxing lyrical about a new patisserie that had opened on her doorstep, so I went to investigate before lunch. She was right – this is one to add to your food discoveries. Firstly, all the craft trades are well represented on the Northcote Road, with butchers (Dove & Hennessy’s), bakers (Breadstall) and cheesemongers (Hamish Johnston) all doing a great job along with the historic market which dates back to the 1860’s. But more interestingly is the fact that many new concepts are launched here. 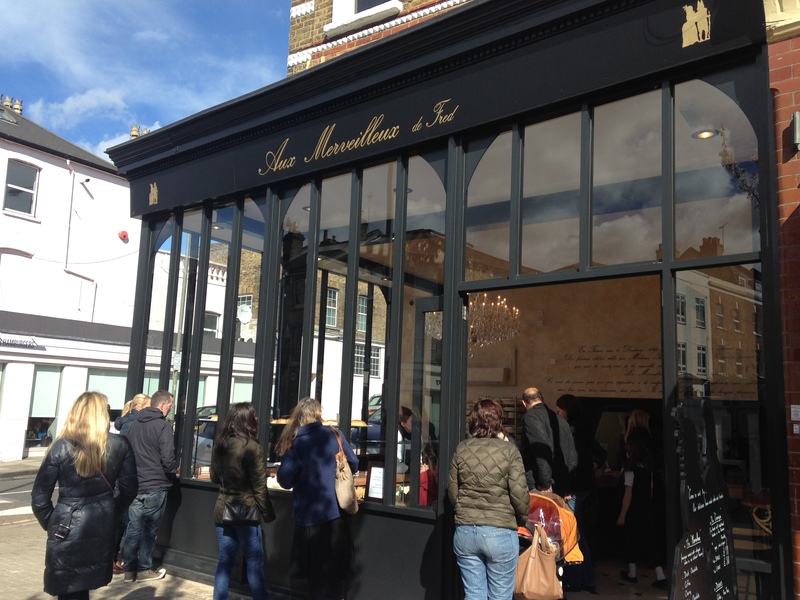 The original Jamie Oliver’s Recipease was created nearby on St John’s Road and Franco Manca is a centrally situated serving up their signature sourdough pizzas which was the first outpost of the original Brixton Village pizzeria. The new place to discover is Aux Merveilleux de Fred. You can read about the history of these creations on their website, but needless to say, there is a very good reason why they translate into ‘wonderful’. The concept originated in Lille and now has two outlets in London, the second one here almost on the doorstep of my friend’s house! Here you have two perfect meringues bound together with cream and coated into a perfect ball of sweetness that seem to be incredibly popular, if you note the queue of people waiting to pay £1.70 for a mouthful of meringue. They are created in front of the customer and make the most perfect gift with beautiful boxes just like all the best French patisseries. Luckily enough, my friend is in her own right an award winning cake maker and she told me very clearly not to buy anything from there as she had made her own, so after an indulgent long lunch we were treated to her version which disappeared in a melting moment. When you are as talented as she is, you too would conclude that you could do it yourself for a much better price, but my skills are not in that league, so know that you can find Fred’s on the Northcote Road or in South Kensington! 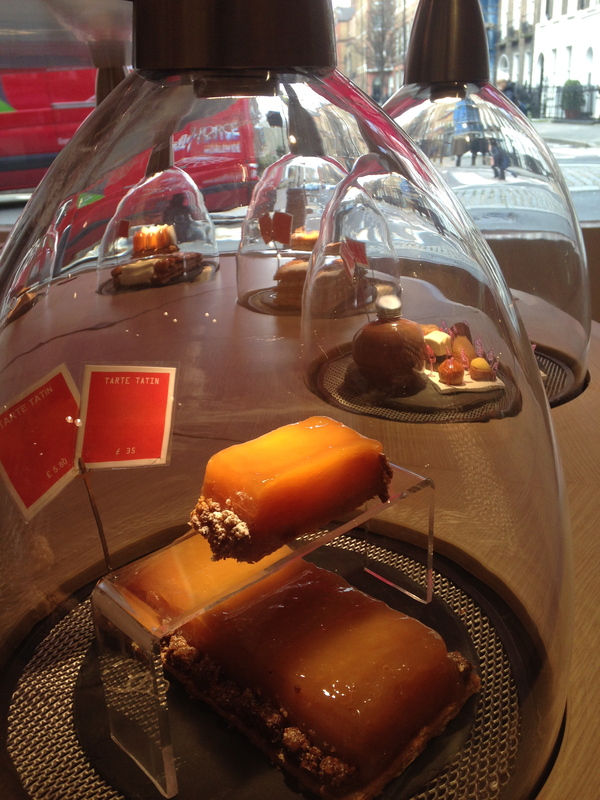 These meringues are only one of a few French patisserie outlets that have crept over the pond recently. 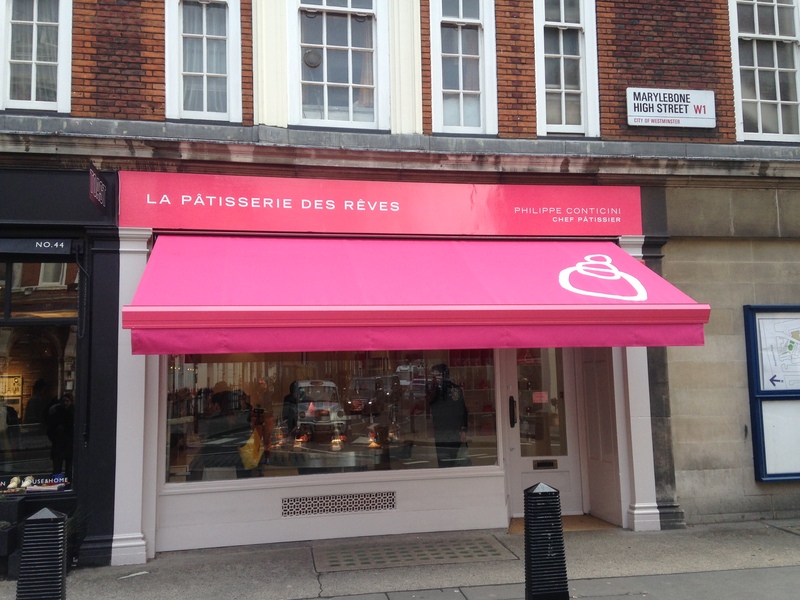 The other one I have visited in the past weeks is La Patisserie des Reves at the top of Marylebone High Street (my fave – remember). 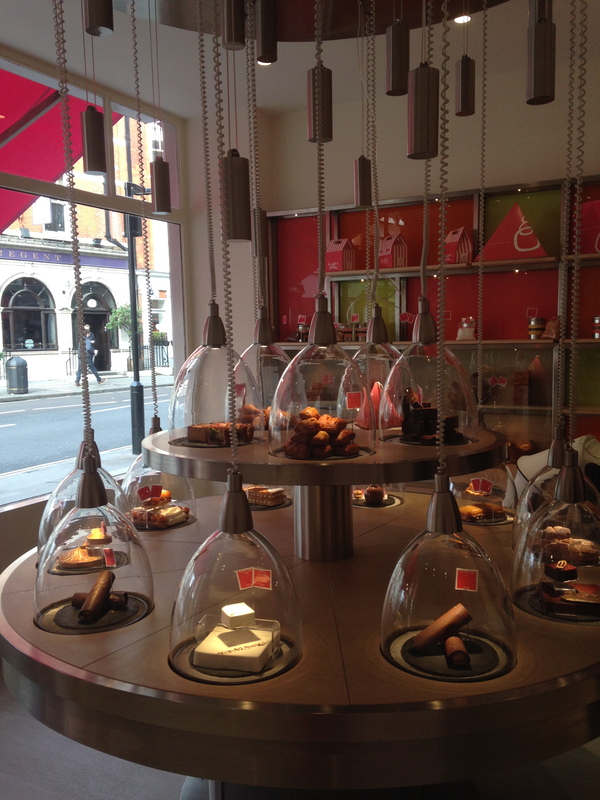 This is an impressive shop with bold domes of patisserie screaming from the central table, although I have it on good authority that the pastries are not baked fresh, but only baked off, so not as wonderful as their Parisian counterparts. Nevertheless, they are pretty impressive and sit alongside the revival of doughnuts, the cronut imposters, the macarons and all the other classic French pastries that have been inspired by our renewed interest in baking. Thanks Mary Berry. We like this fashion and look forward to ever more concepts travelling across the channel. 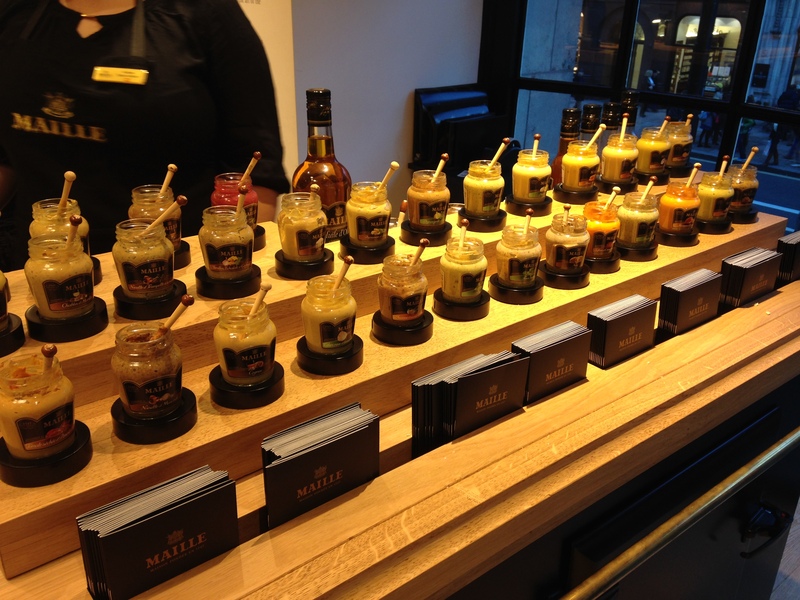 I finally got into Green Park last week to have a nose at the Maille shop in Piccadilly which opened at the end of October. 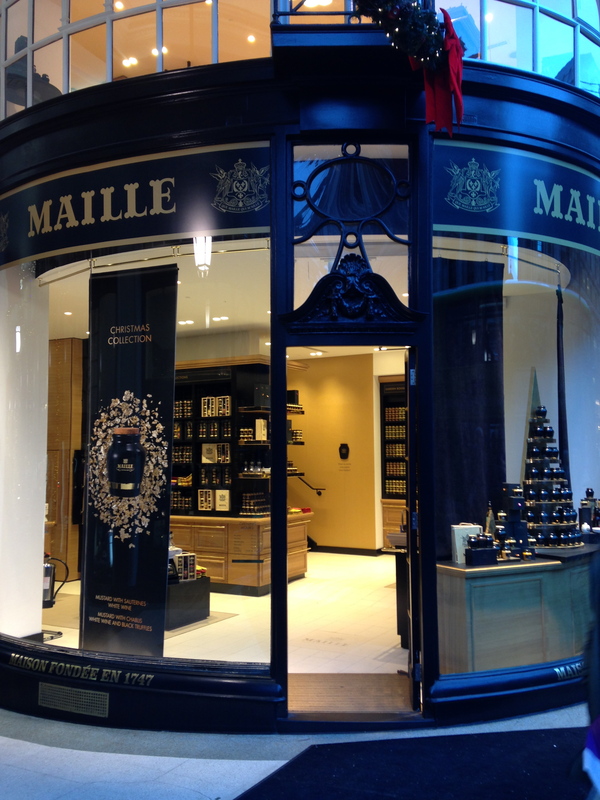 This is the first London outpost of the successful French formula already in Paris and Dijon. It represents another outlet in the grand scheme of people doing one thing very well in order to promote their product and their brand. I saw a lot of this in NYC and equally so there are plenty in London: doughnuts, coffee, pickles, oils, etc. It feels like the next iteration of the pop up culture so I guess it is a sign that sites are becoming available at prices that make sense. Roll on the food boutique. 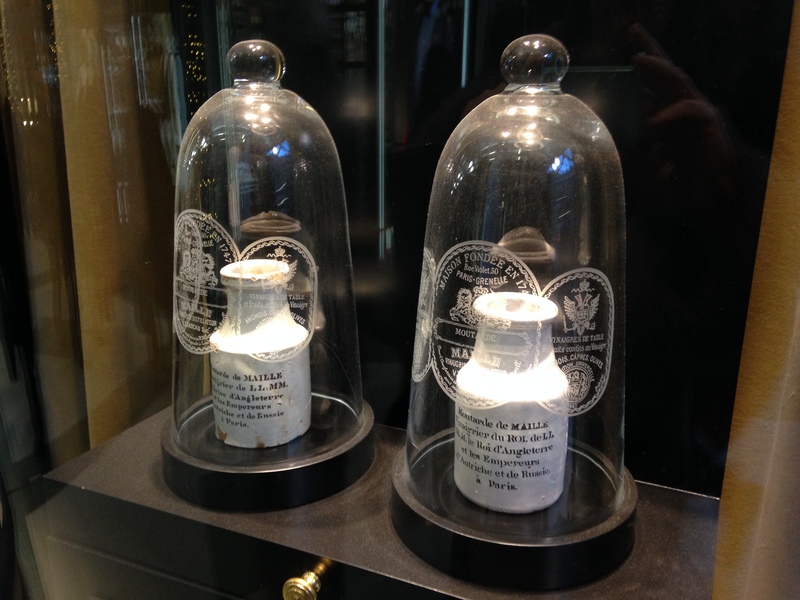 The shop does a really great job of telling the story of this mustard brand. 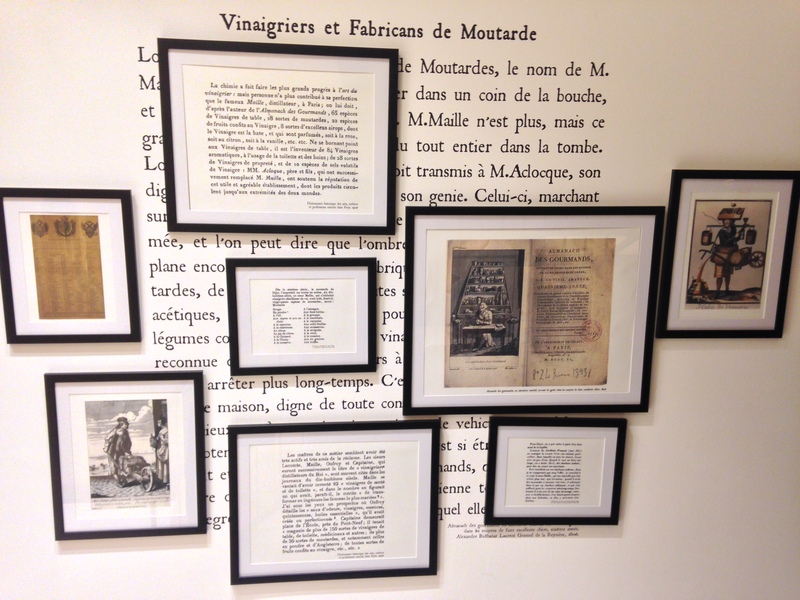 It was founded some 265 years ago and shares the history in simple bold ways: old mustard jars in the window, the brand story told on bold black and gold decor along with pictures on the wall and fun quotes throughout the staircase leading you upstairs. There are tasting bars both upstairs and down so that you can engage with the whole range of products and boy, what a range! For those of you who think there is only wholegrain and dijon mustard in the range, think again. 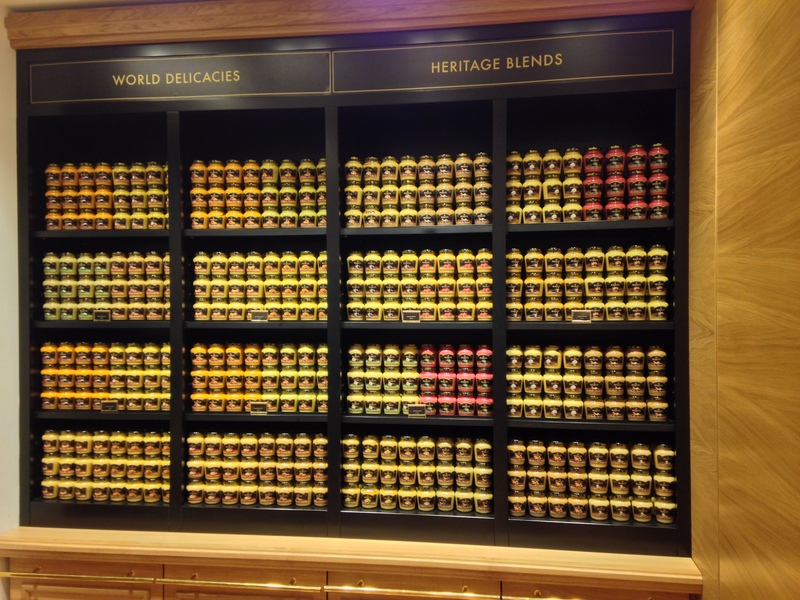 There are over 60 mustard products here ranging from the simple to the crazy. 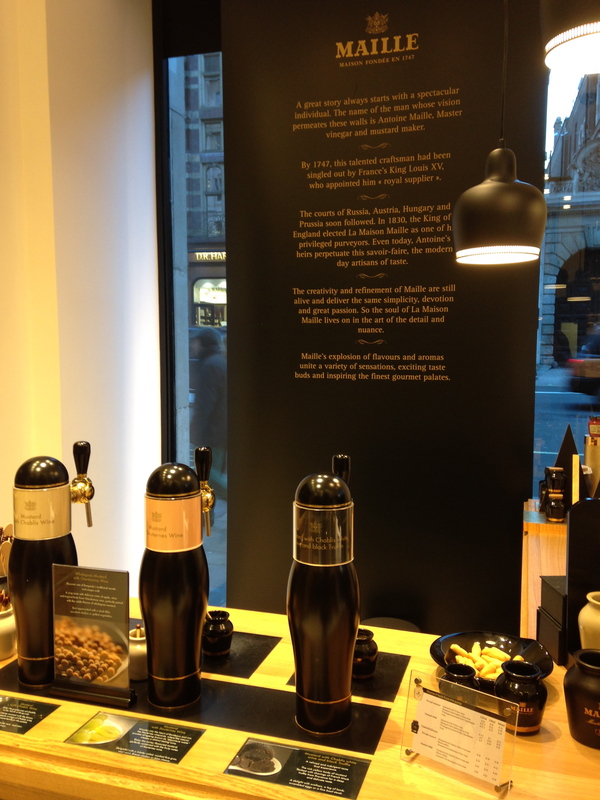 The luxury end boasts truffle and Chablis, or simple Sauternes which can be bottled traditionally from the pump. Also a surprise to me was the range of oils, vinegars and pickles also under the brand. 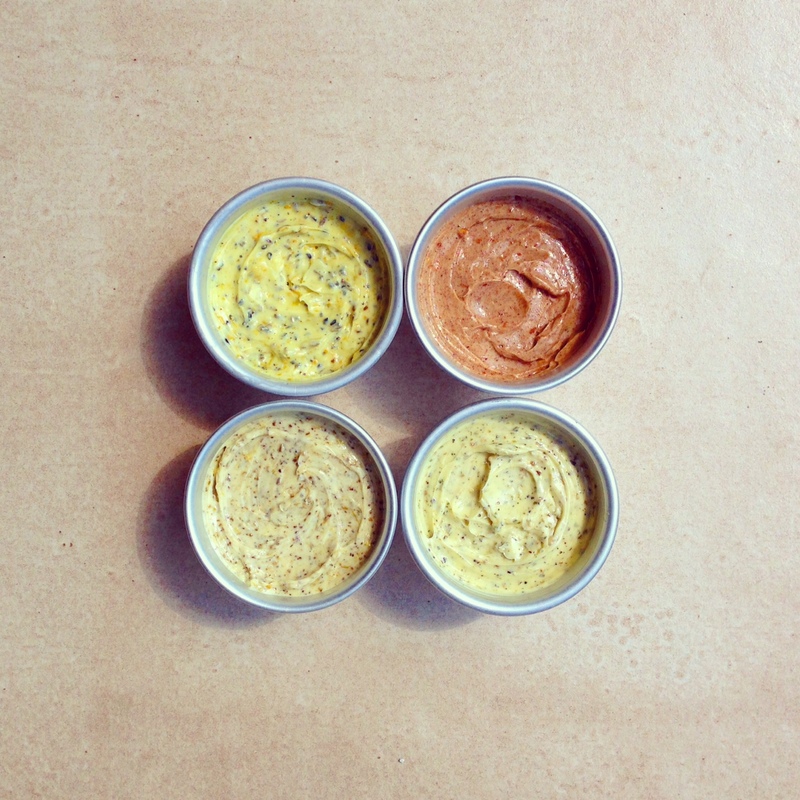 Who knew there was so much you could do with mustard? This is a great place to find an unusual gift and to be treated to some good old fashioned service in a lovely retail environment.